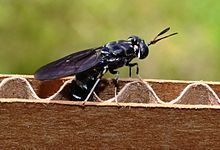 The black solider fly, also known as hermetia illucens or BSF for short, is a composting marvel and it even self harvests, so we can feed our fish by turning organic waste material into protein packed feed 🙂 Native to the warmer climates and available as juveniles for sale to those in colder climates for summer time fun and feed. Here is the BSF Biocomposter that we built. We modeled ours after the one that we list in resources section at the end of this post; however, our container is a bit larger than the original. 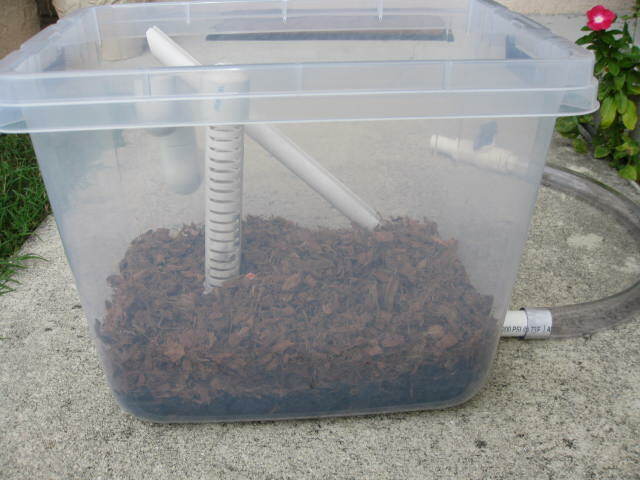 Our egg laying material is HVAC filter squares cut into small sections and we filled the composter up to the drain tube with charcoal and a few inches of coconut coir chips. Our DIY composting bins utilize self-harvesting by capitalizing on the natural life cycle of the BSF. 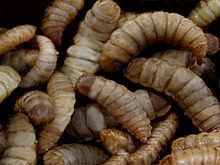 When the larvae have completed their larval development, they enter a stage called “prepupae” wherein they stop eating, they empty their guts, their mouth parts change to an appendage that aids climbing, and they seek a dry, sheltered area to pupate. This prepupae migration instinct allows us to self-harvest the mature larvae. Our container has a ramp on the side to allow the prepupae to climb out of the composter and drop off into some plumbing fitting that end up into a collection area. They are then frozen and feed to the tilapia as a protein source. Don’t forget to rinse weekly. Will keep you updated as we progress. 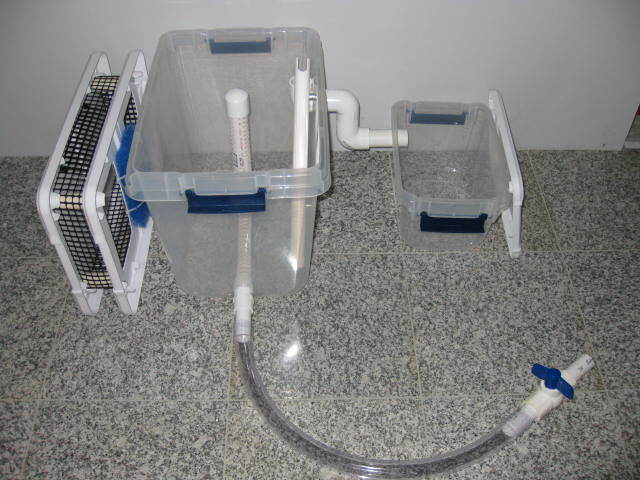 This entry was posted in Aquaponics, Backyard Aquaponics, Commercial Aquaponics, Homesteading, Pastured Poultry, Permaculture, Uncategorized by greenviewap. Bookmark the permalink.